In Call of Gods, you can transmute more high quality equipments. If you have enough materials, you can do that. When you want to transmute, you can go each main city to visit transmute master. 1. Transmute is divided into two categories, normal and advanced. 2. Choose which one you want to transmute. 3. 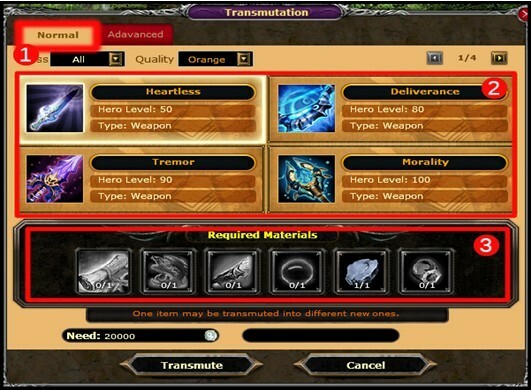 It will show you how many materials you need if you want to transmute this equipments. And if you both have enough slivers and materials, click theÂ Transmute button, it will be success. All the transmute rate will be 100%.